Being that cauliflower is one of my most favorite vegetables, I knew I’d be a fan long before I tried it. Cauliflower’s versatility is endless. I find it steps in fabulously on the plant based table for things like shrimp, scallops and fish, and even steak (my dad would roll his eyes). But rice…. who knew? It’s super simple to create cauliflower rice too. All you need is a food processor to break the cauliflower down into little rice bits, then it’s ready to use in a recipe. 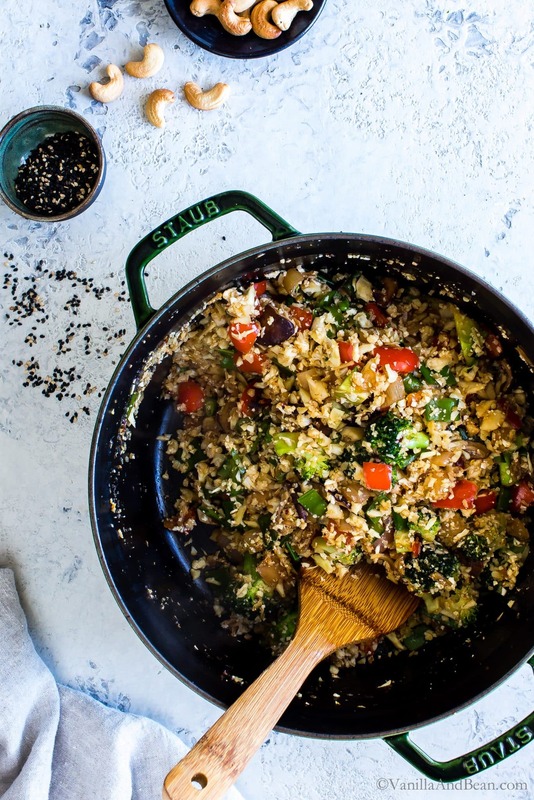 This cauliflower rice stir fry is simple to make. Just be sure to have all the ingredients prepped before turning on the heat. 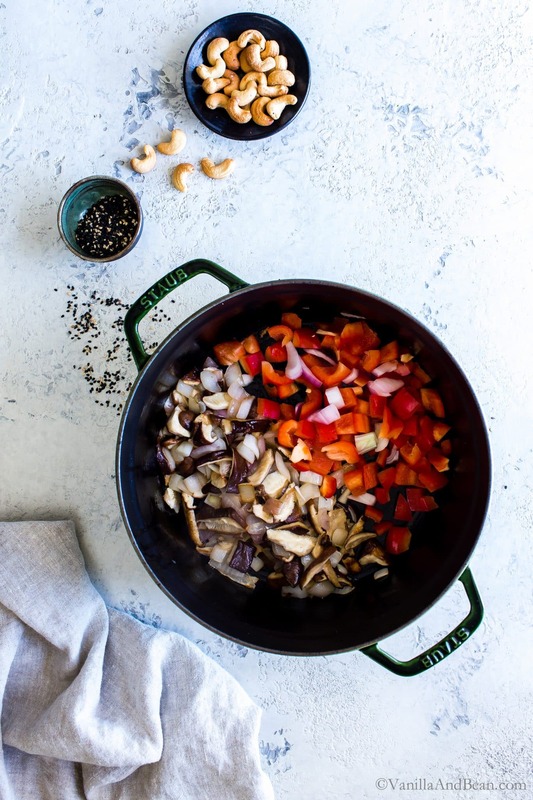 In your largest nonstick pan, wok or Dutch oven, start with a bit of toasted sesame oil, then stir-fry the onions, mushrooms and bell pepper. Next, add the fresh garlic and ginger – take a long breathe in; ahhhh can you smell that (!!) then deglaze the pan with Tamari and Liquid Aminos (this keeps the cauliflower fried rice plant based). 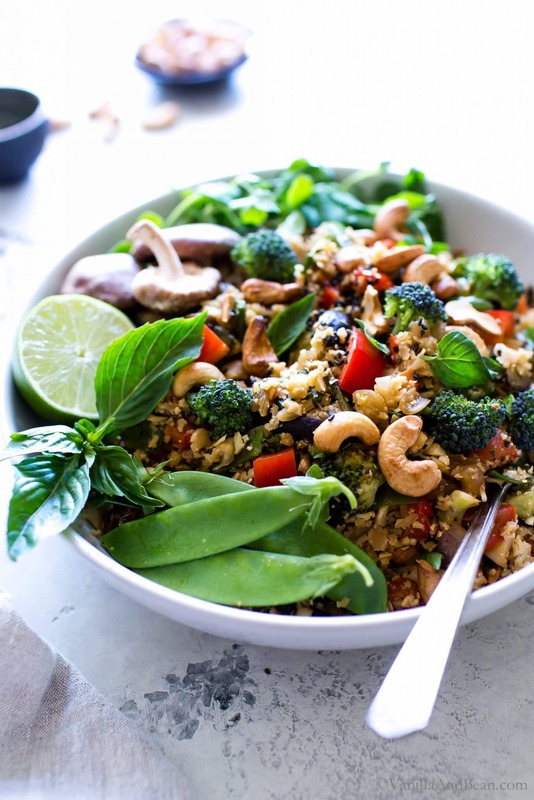 Spoon in the cauliflower rice, toss in the broccoli florets and after a brief stir fry, add the snow/snap peas, cashews and basil. Last, adjust the seasonings to taste and dinner is done! 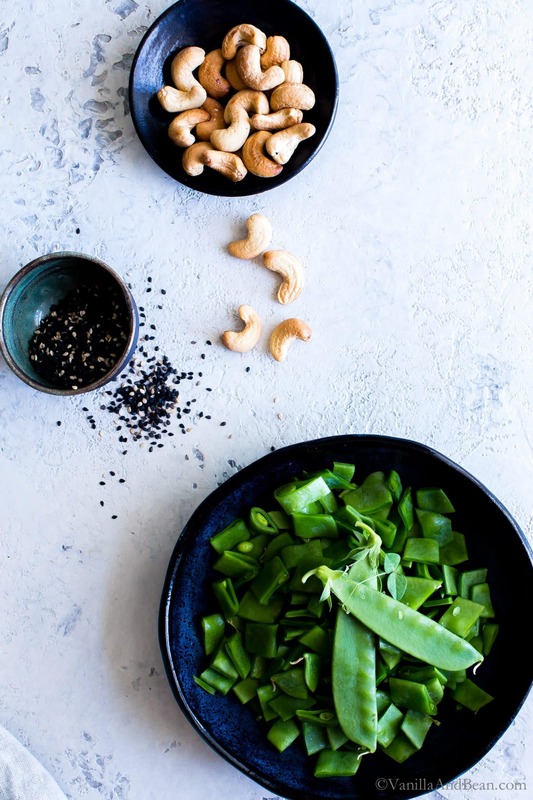 Have some of those umami building toppings to add to each heaped bowl of cauliflower fried rice like sesame seeds, Tamari, more cashews and Thai basil, green onions and lime. Be sure to have all your ingredients prepped and ready to make cauliflower fried rice before turning on the stove. The veggies cook super fast and over-cooking can result in mushy veggies. We’re going for tender crisp veggies. For meal prep, rice the cauliflower a few days ahead and store in a lidded container in the fridge until ready to use. I didn’t prefer the results of pre-frozen cauliflower. No need for wringing or drying out the cauliflower before using it. Just rice it and it’s ready to go. Freezer friendly? I wouldn’t recommend it. The veggies are best just after cooking or gently reheated the day after. Don’t throw out those broccoli stems! Shred it and include it in cole slaw or broccoli slaw. Liquid Aminos: I use it in place of fish/oyster sauce in my Asian cooking. It tastes similar to Tamari, but perhaps teases out more of that umami flavor in Thai recipes without using fish/oyster sauce. Cauliflower fried rice is vegetarian and vegan friendly; a fried egg or prepared tofu is a delicious addition to this recipe. Looking for more information on cauliflower rice? Denise has a How to Make Cauliflower Rice tutorial. 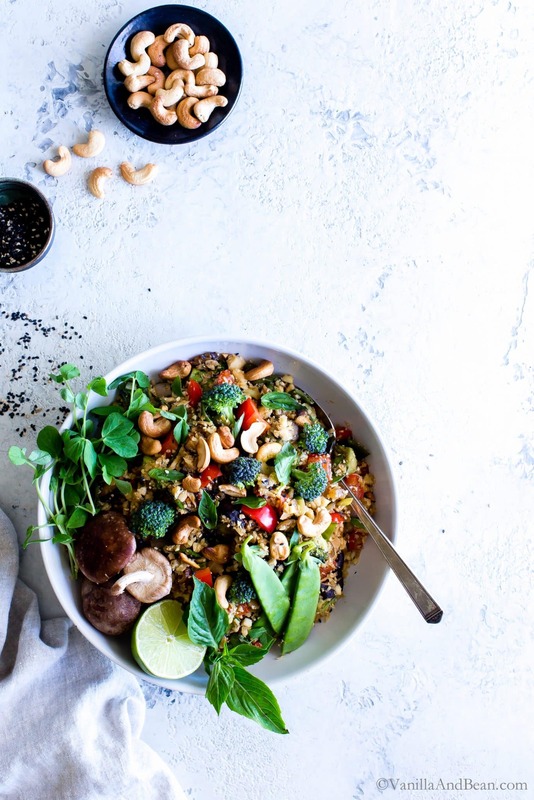 Vibrant, nourishing, and packed with umami flavors, Thai Vegetable Cauliflower Fried Rice with Cashews comes together with ease and makes a hearty Thai inspired dinner. Top it with an optional fried egg or prepared tofu to stretch this main even further. 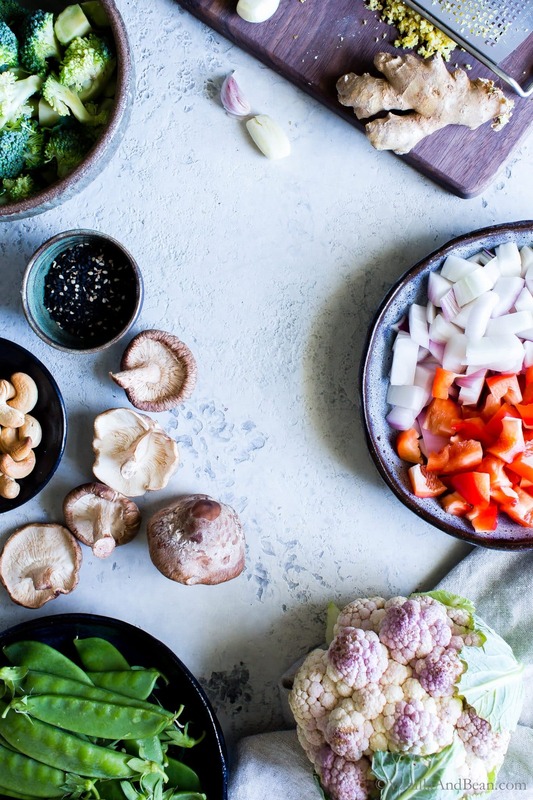 vegan + gluten free *This recipe comes together fast once the veggies are prepped. Have everything chopped and measured out before turning on the stove. The veggies cook fast, and we're going for tender crisp, not mush. Fried Egg or Prepared Tofu on the top! For the Cashews: Preheat oven to 350F (180C). Place the cashews in a baking pan and bake for about 12-14 minutes until fragrant and golden. Set aside to cool. Rough chop. For the Cauliflower: In the bowl of a food processor fitted with the S blade, and working in batches, add about 1/2 the head of cauliflower in large chunks. Pulse 8-10 times to break the cauliflower down into 'rice'. Scrape the work bowl down as needed. Transfer to a bowl and set aside. To Make The Cauliflower Fried Rice: In a large Dutch oven, add the sesame oil and heat until shimmering. To test to see if the oil is hot enough, toss in a piece of onion. If it starts frying, it's ready! Add the onions and saute for two minutes on medium heat. To the onions, add the mushrooms and stir fry for two minutes. Add the bell peppers to the onions and mushrooms and stir fry for two more minutes. Add the garlic, ginger and red pepper flakes to the vegetable mixture and saute for one minute on medium-low. The garlic and ginger will start sticking to the bottom of the pan.. Add two Tbs Tamari, Liquid Aminos (or more Tamari) and sugar, stir to deglaze while scraping the garlic and ginger off the bottom. To the Dutch oven, spoon in the cauliflower rice and broccoli. 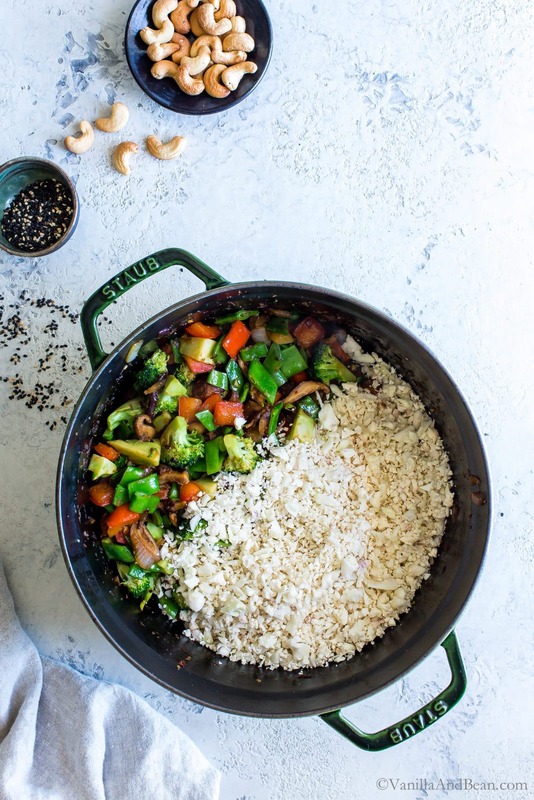 Stir fry for about three to four minutes, scraping the bottom of the pan as needed, until all the cauliflower rice is coated with the oil, the broccoli is tender and the veggies are evenly distributed. During the last minute of cooking, stir in the snow or snap peas, stir to warm through for about a minute. Keep an eye on it at this point because the veggies can go from tender crisp to mush quickly. You may notice a bit of moisture form in the bottom of the Dutch oven. This is normal and it typically tends to steam off as the recipe cools. Work quickly here because the 'rice' is still cooking at this point. Remove from heat and stir in about one Tbs of chopped Thai basil. Taste the rice for seasoning adjustment, adding one more tablespoons of Tamari (or more) if desired. This will also help deglaze the Dutch oven. Squeeze in 1/2 lime juice and stir in the cashews and fresh basil or cilantro. Add more herbs to taste. Serve immediately. Spoon the Fried Cauliflower Rice into big bowls, sprinkle or serve with green onions, sesame seeds, more herbs and lime wedges. If serving with tofu or fried eggs, add to the bowls now. For those that love even more spicy, serve with Sriracha. Store in a lidded container for up to three days in the refrigerator. This recipe does not freeze well. *Liquid Aminos: I use it in place of fish/oyster sauce in my Asian cooking. It tastes similar to Tamari, but perhaps teases out more of that umami flavor in Thai recipes without using fish/oyster sauce. It lasts forever in the refrigerator so I don't have to worry about using it up quickly. 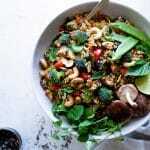 Recipe adapted from my Thai Vegetable Fried Rice with Cashews. I have tried cauliflower rice in place of fried rice and I have to say in all honesty I was let down. But I think it was because there wasn’t enough texture going on in the recipe outside of the rice. This looks like it has a ton of great textures in addition to the rice so I know I would love it here. Plus you can’t go wrong with Thai flavors. So delicious! I agree… when using cauli rice I find the recipe needs to be packed with texture and plenty of flavor builders. Otherwise, it’s pretty flat. So I packed this one good! I haven’t tried this recipe but in my experience with cauliflower fried rice, the sesame oil is what makes it! Don’t substitute!! Such good advise, Amy! Isn’t toasted sesame oil so special? 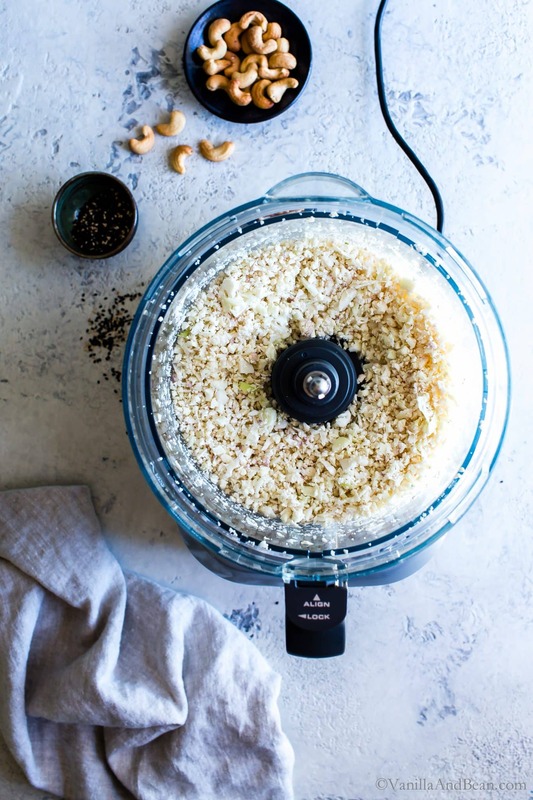 Cauliflower rice is so easy and I just love this recipe with all your gorgeous veggies and cashews! I have to admit that I buy riced cauliflower at the market for the convenience of having it on hand. But you are inspiring me to go buy a head of cauliflower and shred it myself. I add riced cauliflower to a lot of dishes – anytime I am sautéing veggies I add some in and I even add it raw to smoothies. I hadn’t thought to make it the star of the meal – like this delicious stir fry you’ve made. Love all the veggies in here – this would make a satisfying and healthy dinner! 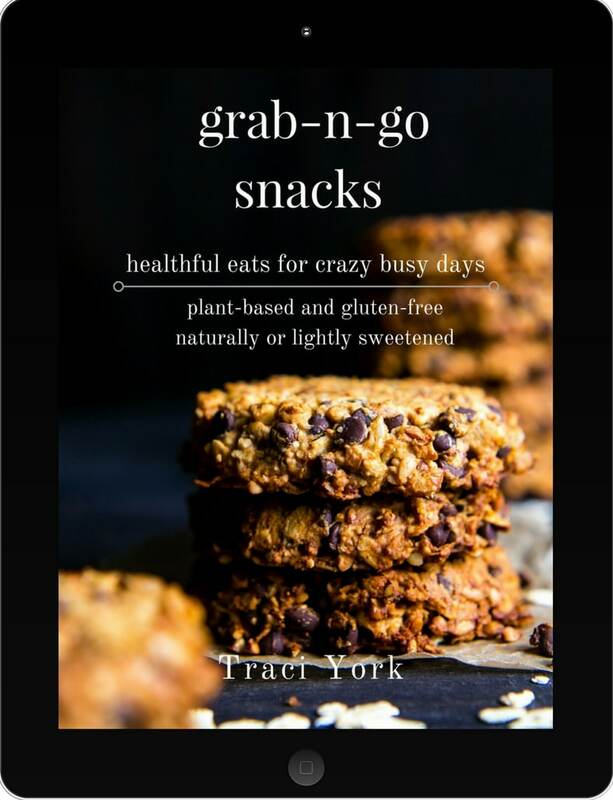 Looking forward to trying this, Traci! That’s such a great idea – since a head of cauli makes a lot of rice! I’ve added it to smoothies too… but add too much and pyuck! I hope you enjoy it, Geraldine! It’s been so long since I’ve made cauliflower rice. I think I was on a little kick when it first came on the food scene, but now I’ve kind of forgotten about it. I need to get back into it. This bowl is calling my name! It took me forever to get on the train! I really love it, but still love rice too. I love how cauliflower picks up all the flavors! This recipe sounds like a winner with so many vegetables! 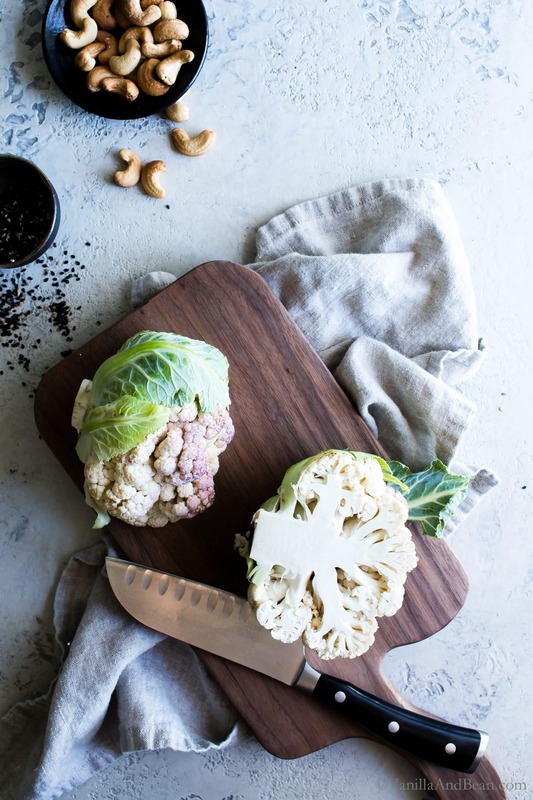 I love cauliflower too as it is such a versatile vegetable picking up any flavors you add. Let me share what I learned from a friend. Don’t throw the leaves away…they are great sauteed with a little oil and garlic! I look forward to trying it…right now I am searching for ways to use all the zucchini and cabbage coming in from the garden! First of you, you are such a darling. Thanks for tagging my dear. And I absolutely love cauliflower rice and shot one different one last week for the blog. Yours though is so filled with flavor, and so colorful. In love, I must say. Beautiful pictures as usual my friend. I love cauliflower rice Traci. But you know Mr. P…shocking…not a fan. So I’ll need to make this and enjoy it myself! 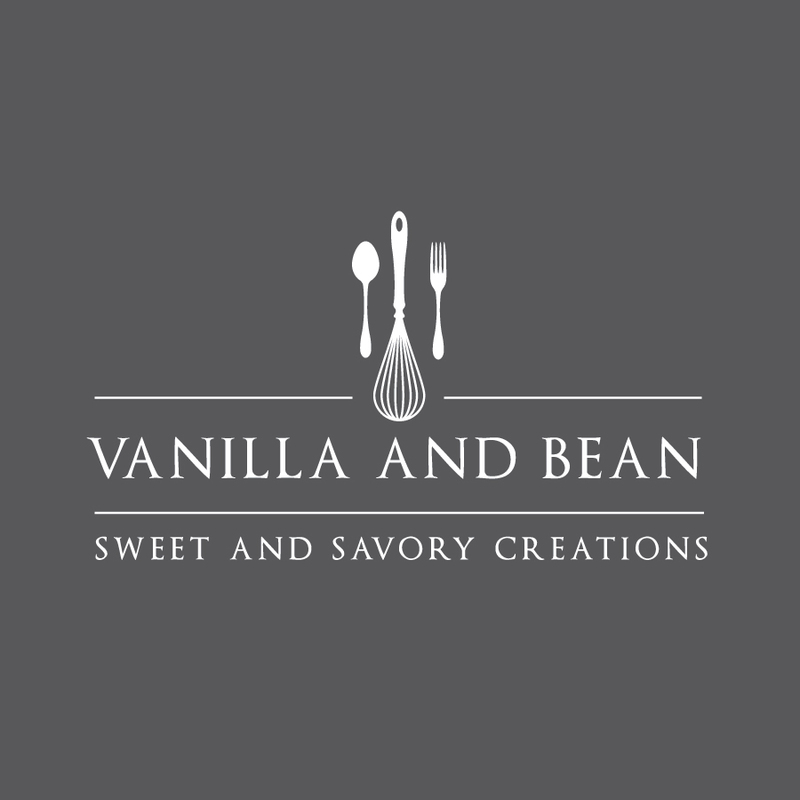 All the flavors sound so delicious though that I ‘m wondering if I can possibly entice him?? He actually loves the other veggies you’ve got in your recipe. Perhaps the smell of it cooking will get him on board! You know I’m always trying! LOL! Shocking/notshocking! I was almost surprised that Rob loves this recipe! Although he loves veggies, this is definitely not ‘regular’ – his word lol! Way to go you for your efforts!